Most of you know, I love Suave products. It's a product that as a child my mom and aunts used while I was watching them do their own hair. The products always work wonders to their hair and they had the most elaborate bangs ever...my hair styles more low key but the Suave works just as well as salon brands. My golden locks need moisture and a good shampoo and conditioner that will nourish my hair and so I tried Suave Professionals® Coconut Oil Infusion. I love that not only does the collection have a shampoo and conditioner but it has a repair treatment. I use this to repair and reverse my hair damage. I have noticed a great difference since using the products. Suave also has a biotin collection, Keratin Infusion, Moroccan Infusion Shine, and Keratin Infusion Color care, which is my next purchase. The good thing ladies, is that we get salon professional products for less and we can purchase it at our local H-E-B. Sometimes I question myself and If you’re like me and not sure which Suave products to try first, try taking the Suave Hair Quiz here and answer a few questions about your hair type and wants. At the end of the quiz, you’ll be served a product recommendation based on your answers, so you’ll know exactly what to pick up the next time you head into H-E-B. 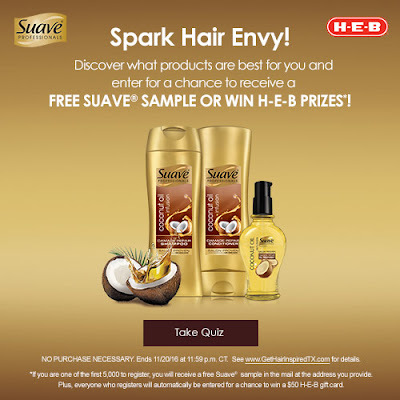 Plus, all who take the quiz can register for a chance to win a free Suave Professionals Keratin Infusion shampoo AND a $50 H-E-B gift card.